If you are into healthy alternatives, and have a sweet tooth like me but trying to maintain a healthy weight, and if you are diabetic and have to watch your blood sugar level after meal or if you are just simply trying to loss weight but can't give up your favorite dessert. Great news!! There is a company out there that makes healthy and natural alternative for sweeteners. Yes! natural and NOT artificial sweeteners. I am so glad that I was given the opportunity to review their products. I am a health conscious person but I also have a sweet tooth, I need to balance the two. I want to enjoy my sweets while maintaining a healthy body and healthy weight. Before I share my review, let me tell you first what I learned about this company. We take a lot of pride in supporting sustainable "Green" business practices. Many of our shipping containers utilize the so called "Packing Peanuts", however several years ago we converted these "peanuts" to a more environmentally conscious packing material using a VEGETABLE STARCH product that completely dissolves in water. NuNaturals is a member of the American Herbal Products Association and the NNFA as well as their TruLabel Program. We absolutely guarantee that what is on our label is contained in the product and no more. We work very hard to source the Best Quality Herbs and Nutrients available. The "Natural flavors" contained in some products are from pure plant extracts. If it's not on the label, it's not in the product. 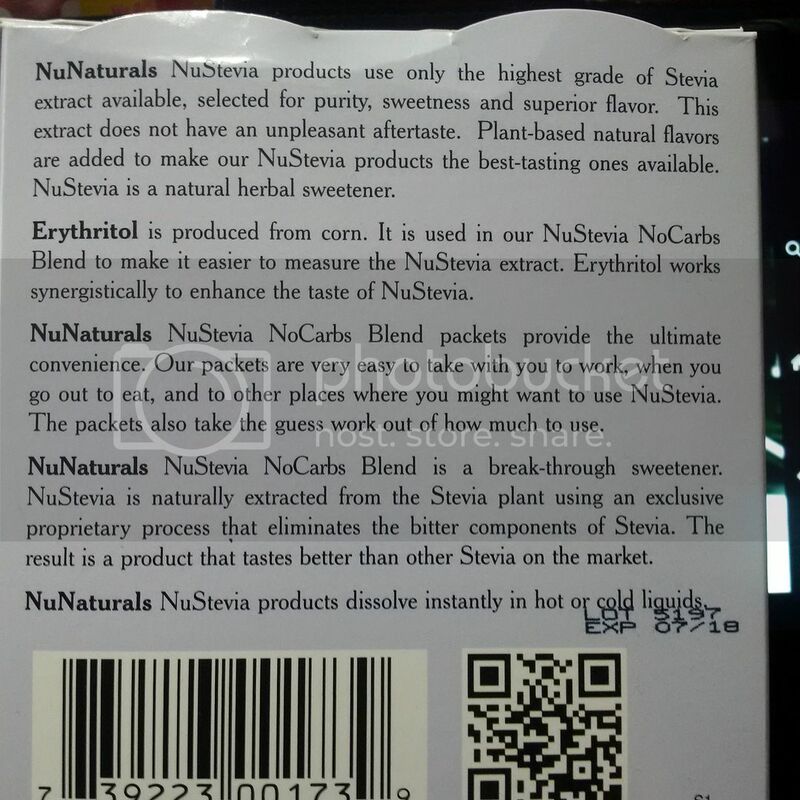 One of the products they sent me is the NuStevia™ White Stevia Powder in 100 packets. What I like about this is that it doesn't have that bitter aftertaste and it is zero calorie. For a coffee drinker like me, I always want my coffee sweet. I do not like adding fresh milk to my coffee because it is not sweet. I do not like adding sweetener either because they have bitter aftertaste, yuck! Most of the time I use the liquid coffee creamer or non dairy creamer but who knows what health risks or side effects a non dairy creamer ingredients can bring and it has no nutritional value. Finally with NuStevia I can enjoy my coffee adding fresh milk as my creamer. Not only I can enjoy a cup of sweet coffee but I also get nutrients and vitamins from fresh milk. The sweetener has NO bitter aftertaste and it has zero calories. Another NuNaturals products they sent me for review are their Pure Liquid flavored Stevia that comes in Lemon, Cherry Vanilla and Peppermint flavor. These natural pure liquid flavored sweeteners can be added to your favorite beverages or recipes. What I love about these products is that it doesn't have unpleasant smell or a bitter aftertaste. Don't forget to SHAKE WELL before using. Lemon NuStevia Alcohol Free 2 oz for $14.15 per bottle - For individual sensitive for alcohol this is for you. This gluten free lemon flavored Stevia can be added to your tea or coffee, yogurt or sparkling water(makes awesome sugar free soda). 7 drops taste as sweet as 1 tsp of sugar. I added mine to my coffee and I was like wow. Never tried a lemon flavored coffee before but I am liking this one. It gave my coffee a twist of flavor of real lemon. I also added this to a cup of cold water, an instant sweet lemonade. Cherry Vanilla NuStevia 2 oz for $14.15 per bottle-Two great flavors combine to make a spectular Stevia liquid extract. Add to your seltzer to make a Dr.NuNaturals soda. 5 drops taste as sweet as 1 tsp sugar. I am not a cherry nor a vanilla flavor person but when I added this to my coffee I loved how my coffee tasted like. The combination of two flavors were good. Peppermint NuStevia Alcohol Free 2 oz for $14.15 per bottle-5 drops taste as sweet as 1 teaspoon. It is great straight out of the bottle. When we were developing this product everyone at NuNaturals tasted the drops by putting a drop on the back of our hands and licking it. Everyone's reaction was the same "Wow! !This tastes like a candy cane." Among the 3 flavors, this is my favorite. I just went crazy with its minty flavor and smell. Adding 5 drops on my coffee daily, yes! I can't drink my coffee without peppermint anymore, my new addiction. You know what I am thinking? I think this is great for making chocolate peppermint cupcakes. These statements have not been evaluated by the Food and Drug Administration. These products are not intended to diagnose, cure, treat or prevent any disease. Disclaimer: This is not a sponsored post. I received these products from NuNaturals for free in exchange of my honest opinion. However all opinions expressed were exclusively mine and not influenced by any means. Wow! I haven't heard of this before but a lot of my clients don't like stevia because of the bitter taste so I'll have to look for it. Thanks for sharing! We've switched many recipes over to Stevia-based products with pretty good results. Every once in a while one won't come out, but for the most part they taste just as good! I haven't heard of NuNaturals before, but sounds like a great product to replace the bitter stevia. Thanks for a great review! WOW In Liquid Now I Love It I Must Try! Good to know! I am going to check them out. We have recently discovered an allergy to artificial food coloring in our family and sweet things tend to have colors so we have to be careful. Plus I try hard to keep anything artificial and unnatural out of our diets. As much as i want to try all these alternative sweetener, I still prefer the real sugar. i can't seem to get satisfied with the sweetness of those sweetener in the packet. We have NuNaturals products in the cupboard and we love them. The drops are my favorite! I have never heard of this before. But I am starting to use more and more all natural stuff as I am thinking the goverment is getting crazy with putting chemicals in everything lol! I will look into it. I also use Stevia to sweeten my drinks. It is just so good. But I still need to learn to use it in baking. There are so many health issues out there that forbid issues, it's great to have these alternatives. this is something I would like to try. Sounds interesting! I like to try their peppermint syrup! I've tried others but I'm not that satisfied since it's either (a) flavor not strong enough for me or (b) bitter after-taste. knowing that the company is in 25years they must be reliable..indeed healthy. My husband is using this now as part of his weight loss journey. This is a good product for those who are really allergic to alcohol. It's good that it's a natural product which can fit the healthy lifestyle of people these days. I actually heard about this product from my MIL. Will try to look for this at the grocery store that I frequent going. I would like to try this sweetener. Looks like very flavorful. Good luck on the giveaway sis and good luck on the entrants. I haven't tried that product yet. I try my best not to put sugar in my tea and coffee. There's no NuNatural products here in Dubai. I'll take note of this and hopefully, I'll be able to buy a few so I can try them. I am interested on those flavored drops to add to your tea. I used up one of my sweetener in cooking, instead of sugar yun ang ginagamit ko.